We take special pride in our olive trees, as we have found ways to grow the trees and harvest the olive without using any sprays or chemicals. Customers praise our trees for their high rate of success — whether they choose 5-gallon containers, 36″ boxes, or something in between — and use them for screening, to create a Mediterranean aesthetic in landscape designs, or to extract their oil and cure their fruit. The word petro (oil) and oleum (olive) make up the word petroleum, which we associate with something quite different than olive oil, but no doubt petroleum carried similar importance in ancient times as it does now. Our trees thrive because of our growing process. We begin by placing varietal tree cuttings in a composted, water-retentive “growth” soil that is heavier than traditional nursery soils. After rooting these cuttings over several months in 2”x2″ containers, we plant the young trees in 1-gallon containers to further develop and gain strength. This cutting-to-container process takes about a year. As the trees grow, we transplant them to increasingly larger containers each year until they’re ready to sell. Though not difficult to grow, olive trees do require attention throughout the year: pruning, fertilizing, and cleaning up leftover fruit. These tips will enhance success and enjoyment of your trees for years to come. 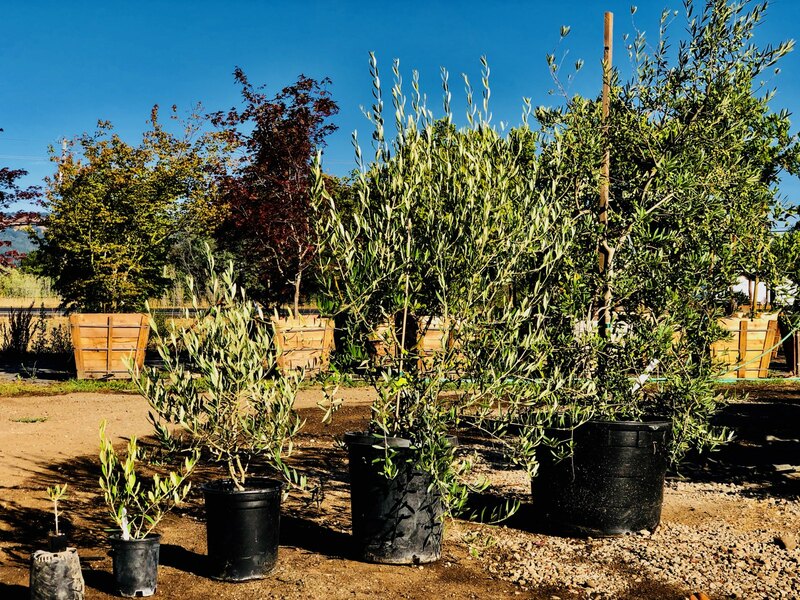 From tiny cutting to full fruition, great care goes into growing thriving and productive olive trees at Sonoma Valley Wholesale Nursery. To choose the proper varietal that’s right for you, consider whether you want the fruit of olive trees for oil or curing, or the plant itself for screening and aesthetics. Then select a tree with good form and lots of green linear foliage. Planting olives trees at proper depth is extraordinarily important. Too many olive trees drown during the winter months because they’ve been planted too deeply. Before digging a hole, measure the bottom of your container to the top of the soil at the trunk’s base, then subtract 3″. This number will be the depth your hole. Now measure the width of your container and dig your hole 12-18″ wider than your container width. Once planted, the base will be higher than the natural grade of surrounding soil. We call this “planting your tree proud” in the ground. We recommend using 25% organic soil amendment to 75% of your native soil. Olives require fertilizer once a year just before new growth starts shooting out. If you use organic fertilizer on a SVWN tree, the fertilizer will activate the organic microbes in the soil and you won’t need to fertilize for another year. Watering is necessary for the first few years, and frequency depends on the tree’s size at the time of planting. We suggest planting a 5-gallon tree with 2 water emitters, and a 25-gallon tree with 5 water emitters. In the hottest part of summer, water 3-4 times per week for 45 minutes each session. If your soil is sandy or has heavy clay, you may need to adjust the watering time. Yellow leaves in the interior of the foliage indicate underwatering. A stressed-looking tree with too-dark leaves indicates overwatering. If you “plant your tree proud” you are unlikely to overwater. During the growing season, after the fruit has set and endocarp (olive pit) has formed, fruit is susceptible to the olive fruit fly, which has heavily infested the wine region. It’s important to identify this pest as soon as possible and take action. If you have damage, bait your fruit flies with yeast bait traps to prevent further damage. Another strategy is to remove all unwanted and unpicked fruit after the harvest season, a method we practice at the nursery to great effect. Keeping trees and soil clean going into winter helps ensure a clean crop in future. The Romans always planted olive trees after conquering a foreign land, mostly for the value of olive oil, which was used as a preservative, cooking medium, and source of nutrient-rich calories. If you have fewer than 500 pounds of harvested olives, you can take your crop to a local olive press when it holds a “community press day.” Your olives will be mixed with others to produce one oil. We recommend growing at least 5 trees, which in time will provide you with enough olives for a custom press, with oil from your trees only. SVWN enjoys growing many fruit-producing varieties, from the high oil content in Spanish Olive Arbequina to the many Italian varieties such as Leccio, Frantoio, and Moriolia. We even offer many regional Italian varieties and grow several types of olive trees for curing. If you’d like to see our olives and taste our fabulous oil, contact proprietor Paul Martinez, who would be happy to arrange a tasting.